Find all of this and more right now at Honda of Greeley in Greeley, CO! Boasts 40 Highway MPG and 33 City MPG! This Honda Fit boasts a Regular Unleaded I-4 1.5 L/91 engine powering this Variable transmission. Wheels: 15 w/Full Covers, VSA Electronic Stability Control (ESC), Urethane Gear Shift Knob. *This Honda Fit Comes Equipped with These Options *Trip Computer, Transmission: Continuously Variable (CVT) -inc: ECON button and ECON mode indicator, Torsion Beam Rear Suspension w/Coil Springs, Tires: 185/60R15 84T AS, Tailgate/Rear Door Lock Included w/Power Door Locks, Strut Front Suspension w/Coil Springs, Steel Spare Wheel, Single Stainless Steel Exhaust, Side Impact Beams, Seats w/Cloth Back Material. Scores 40 Highway MPG and 33 City MPG! This Honda Fit boasts a Regular Unleaded I-4 1.5 L/91 engine powering this Variable transmission. Wheels: 15 w/Full Covers, VSA Electronic Stability Control (ESC), Urethane Gear Shift Knob. * This Honda Fit Features the Following Options *Trip Computer, Transmission: Continuously Variable (CVT) -inc: ECON button and ECON mode indicator, Torsion Beam Rear Suspension w/Coil Springs, Tires: 185/60R15 84T AS, Tailgate/Rear Door Lock Included w/Power Door Locks, Strut Front Suspension w/Coil Springs, Steel Spare Wheel, Single Stainless Steel Exhaust, Side Impact Beams, Seats w/Cloth Back Material. Scores 36 Highway MPG and 31 City MPG! This Honda Fit boasts a Regular Unleaded I-4 1.5 L/91 engine powering this Variable transmission. CRYSTAL BLACK PEARL, BLACK, CLOTH SEAT TRIM, Wheels: 16 Gloss-Black Alloy. *This Honda Fit Comes Equipped with These Options *VSA Electronic Stability Control (ESC), Trip Computer, Transmission: Continuously Variable (CVT) -inc: dual-mode paddle shifters, ECON button, ECON mode indicator, shift lever position indicator, sequential mode gear selection indicator and shift up/down indicator, Torsion Beam Rear Suspension w/Coil Springs, Tires: 185/55R16 83H AS, Tailgate/Rear Door Lock Included w/Power Door Locks, Strut Front Suspension w/Coil Springs, Steel Spare Wheel, Single Stainless Steel Exhaust w/Chrome Tailpipe Finisher, Side Impact Beams. Scores 36 Highway MPG and 31 City MPG! This Honda Fit boasts a Regular Unleaded I-4 1.5 L/91 engine powering this Variable transmission. LUNAR SILVER METALLIC, BLACK, CLOTH SEAT TRIM, Wheels: 16 Machine-Finished Alloy w/Black Inserts. * This Honda Fit Features the Following Options *VSA Electronic Stability Control (ESC), Variable Intermittent Wipers, Urethane Gear Shift Knob, Trip Computer, Transmission: Continuously Variable (CVT) -inc: dual-mode paddle shifters, ECON button, ECON mode indicator, shift lever position indicator, sequential mode gear selection indicator and shift up/down indicator, Torsion Beam Rear Suspension w/Coil Springs, Tires: 185/55R16 83H AS, Tailgate/Rear Door Lock Included w/Power Door Locks, Strut Front Suspension w/Coil Springs, Steel Spare Wheel. Boasts 36 Highway MPG and 31 City MPG! This Honda Fit delivers a Regular Unleaded I-4 1.5 L/91 engine powering this Variable transmission. MILANO RED, BLACK, CLOTH SEAT TRIM, Wheels: 16 Machine-Finished Alloy w/Black Inserts. * This Honda Fit Features the Following Options *VSA Electronic Stability Control (ESC), Variable Intermittent Wipers, Urethane Gear Shift Knob, Trip Computer, Transmission: Continuously Variable (CVT) -inc: dual-mode paddle shifters, ECON button, ECON mode indicator, shift lever position indicator, sequential mode gear selection indicator and shift up/down indicator, Torsion Beam Rear Suspension w/Coil Springs, Tires: 185/55R16 83H AS, Tailgate/Rear Door Lock Included w/Power Door Locks, Strut Front Suspension w/Coil Springs, Steel Spare Wheel. Delivers 36 Highway MPG and 31 City MPG! This Honda Fit boasts a Regular Unleaded I-4 1.5 L/91 engine powering this Variable transmission. Wheels: 16 Machine-Finished Alloy w/Black Inserts, VSA Electronic Stability Control (ESC), Variable Intermittent Wipers. *This Honda Fit Comes Equipped with These Options *Urethane Gear Shift Knob, Trip Computer, Transmission: Continuously Variable (CVT) -inc: dual-mode paddle shifters, ECON button, ECON mode indicator, shift lever position indicator, sequential mode gear selection indicator and shift up/down indicator, Torsion Beam Rear Suspension w/Coil Springs, Tires: 185/55R16 83H AS, Tailgate/Rear Door Lock Included w/Power Door Locks, Strut Front Suspension w/Coil Springs, Steel Spare Wheel, Single Stainless Steel Exhaust, Side Impact Beams. Scores 36 Highway MPG and 31 City MPG! This Honda Fit boasts a Regular Unleaded I-4 1.5 L/91 engine powering this Variable transmission. Wheels: 16 Machine-Finished Alloy w/Black Inserts, VSA Electronic Stability Control (ESC), Variable Intermittent Wipers. * This Honda Fit Features the Following Options *Urethane Gear Shift Knob, Trip Computer, Transmission: Continuously Variable (CVT) -inc: dual-mode paddle shifters, ECON button, ECON mode indicator, shift lever position indicator, sequential mode gear selection indicator and shift up/down indicator, Torsion Beam Rear Suspension w/Coil Springs, Tires: 185/55R16 83H AS, Tailgate/Rear Door Lock Included w/Power Door Locks, Strut Front Suspension w/Coil Springs, Steel Spare Wheel, Single Stainless Steel Exhaust, Side Impact Beams. 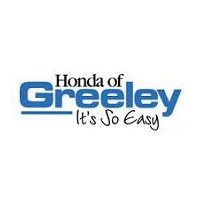 Why Choose New Honda Vehicles at Honda of Greeley? When you check out the new Honda vehicles at Honda of Greeley, our team will be here to greet you with excellent service every step of the way. From our knowledgeable sales staff and well-resourced finance team, to our certified service technicians, we’re here for all your Honda needs! Contact us online or by phone with any questions.